On such a gorgeous day as this (hey, we’re actually having some warm, sunny weather in June! ), I just had to get out on an urban hike. I love walking the streets and getting lost in the plant varieties growing around town. With the hilly terrain of San Francisco, I especially love finding and climbing public staircase streets and checking out the views from the tops of the hills. All these little blocks of staircases and steep foot alleys (and there are 100’s – Sister Betty talks about some of them) usually have stunning plantings alongside. That made me think about this great little park up the hill from me that has these fantastic, long concrete slides built into the hillside. It seemed like a great place to write about! 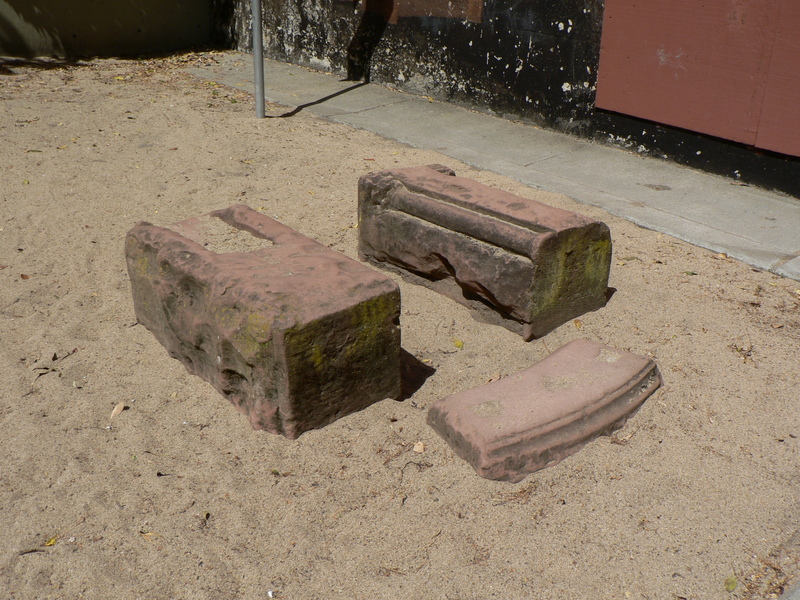 Seward Mini Park in SF is really a little neighborhood treasure. 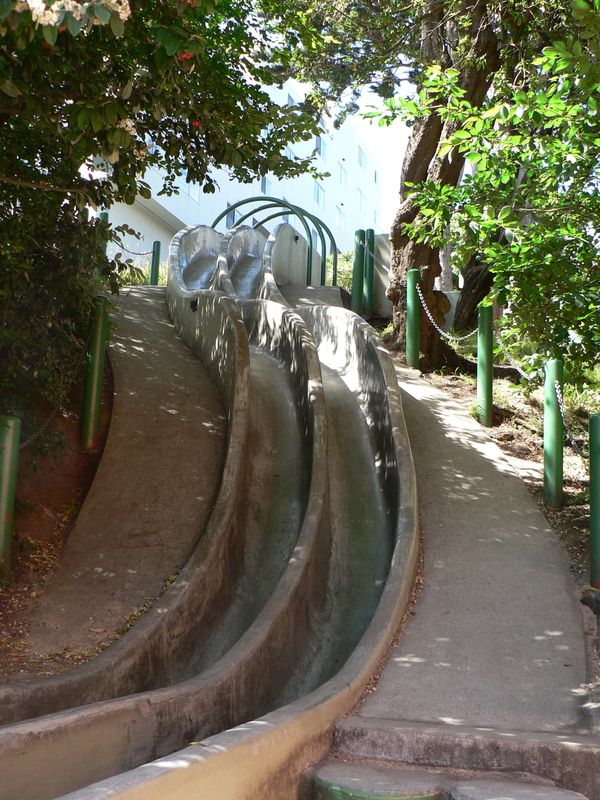 The Seward Street Slides have quite a following among enthusiasts, but the park is more than just the slides. Aside from the fun there’s a great selection of plants, including many California natives, along the upper half of the park on Corwin. (Great place for CCSF Plant ID students to visit, hint hint! 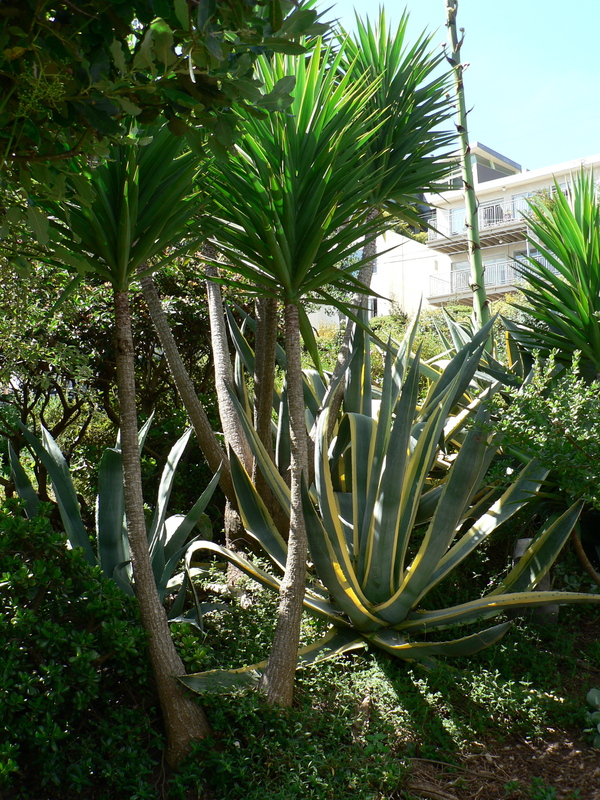 Plants are labeled like a botanical garden…) The whole park is such a beautiful, restful retreat. It’s shady, especially at the bottom, but sheltered from the winds. Benches throughout the sunny upper garden portion offer the visitor a place to sit and reflect in shaded alcoves, or enjoy the smells and sounds of the garden. At the bottom of the slides are an impressive bas-relief retaining wall and some special stones to sit on. 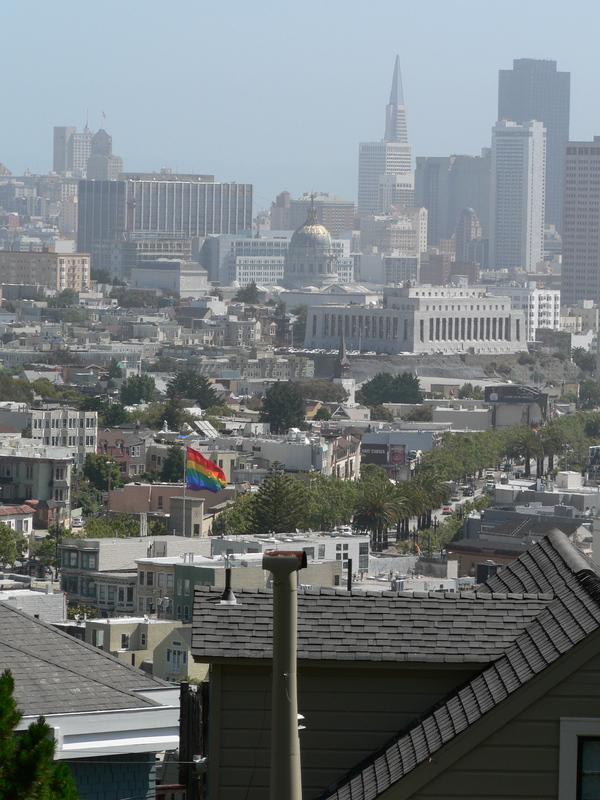 The Castro's giant rainbow flag, seen from the park. A sign at the top of the park tells of the park’s history, but it’s very faded and watermarked from the rain. From what I remember when I first came upon it a few years ago, it was slated to be developed into a 150+ unit apartment building, but neighbors wanted more open space. There was something historic about this park, such as perhaps it was SF’s first park brought about by sit-in or something like that, but I’ll leave that to the historians. The concrete slide was built for the park’s official opening in ’71. Fittingly, it’s a solid concrete symbol of permanence for the community’s efforts. Today, you’ll find a pile of cardboard at-the-ready at the bottom of the slide. 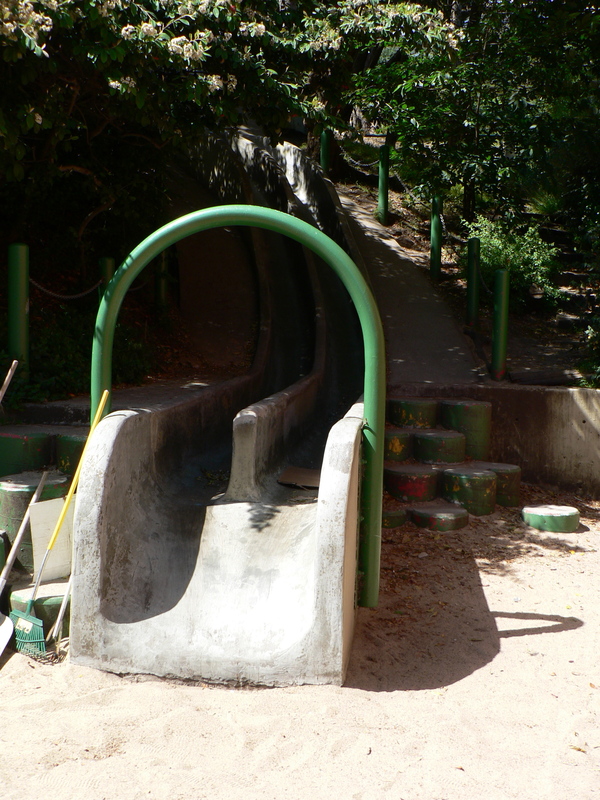 A climb halfway up the park brings you to the top of the slides, and DOWN you go! Full shot of the slides. The garden at the top of the park is really pretty special, too. I love this community effort to create a botanical garden of Mediterranean climate and California native plants. The big sign board with the park’s history hosted a map of the little park, with the plants all labeled out on a schematic. The numbered list of plants is still intact, at least. Major plantings also have individual ID tags. It’s a great place right within the City to see mature specimens of many native plants, without having to drive out anywhere. From hedgerows of Salvias to the canopy of Monterrey Cypress, or a colony of Cotyledon orbiculata hidden in a niche with a giant urn, the park is thoughtfully planted to provide sensory interest and habitat. If you’re ever in the area and up for a moderate urban hike, I highly recommend a visit to Seward Mini Park! 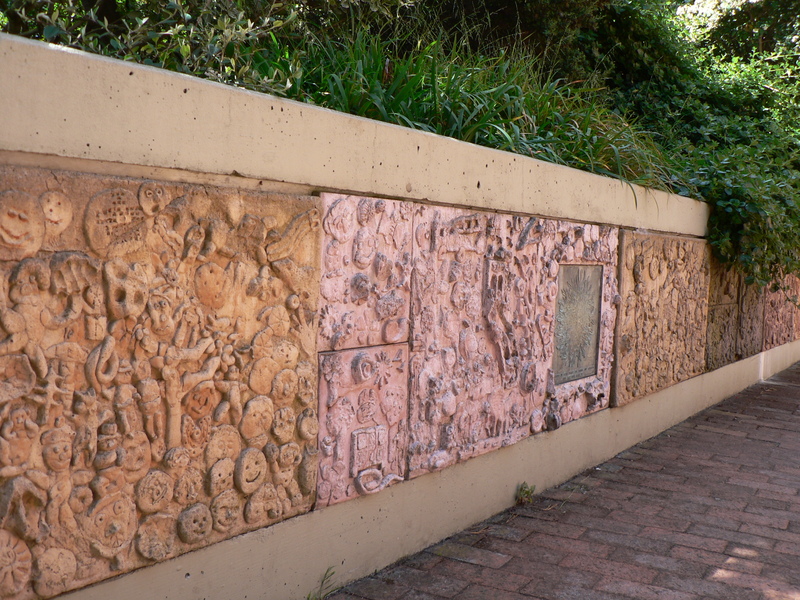 The terra cotta bas-relief wall. 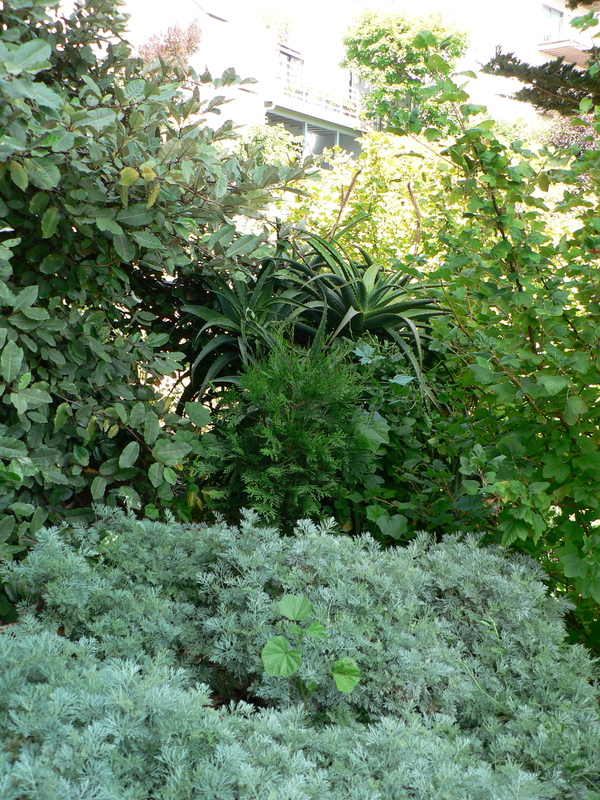 Drought-tolerant plants abound, with some thoughtful layouts. 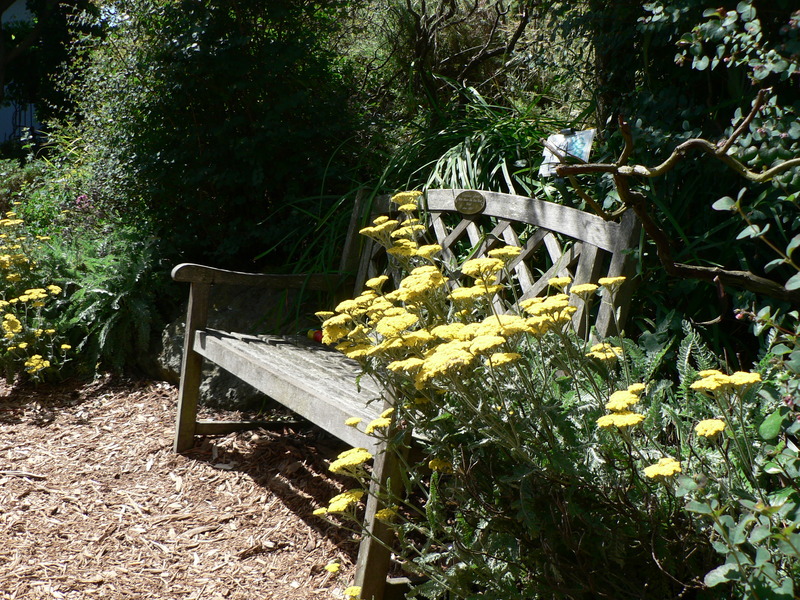 A bench nestled among Achillea. 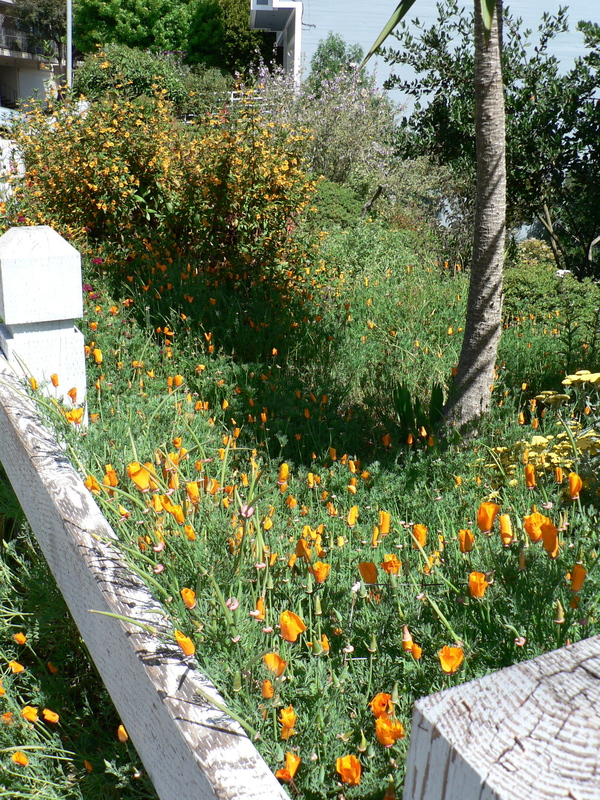 California Poppies top off the garden at the uppermost fence. This entry was posted in Gallery Posts, Urban Hikes and tagged botanical, california natives, garden, gardening, horticultural, natives, parks, recreation, san francisco, staircases, succulents, urban, urban hike. Bookmark the permalink.